Special CBI counsel Satish Dinkar said this is the first conviction tracing the inter-state ramifications of the Vyapam scam after the central agency took over the investigation in 2015. 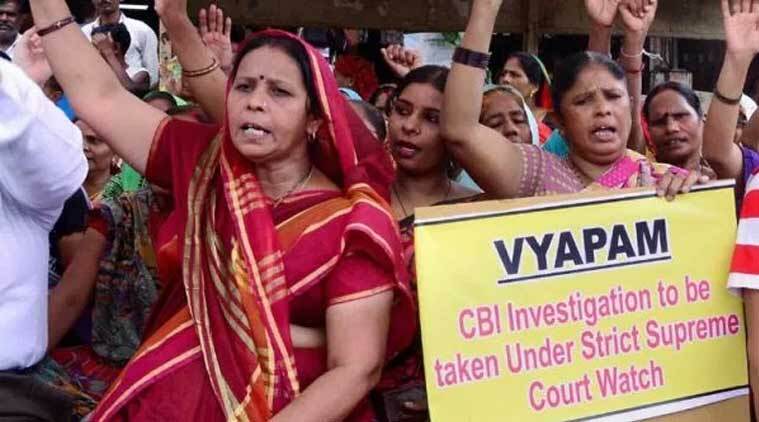 Five people, including a candidate, an impersonator and a middleman, were sentenced to seven-year imprisonment for irregularities in recruitment test for police constables conducted by Vyapam, by a special CBI court in Bhopal on Tuesday. Special CBI counsel Satish Dinkar told The Indian Express that this is the first conviction tracing the inter-state ramifications of the Vyapam scam after the central agency took over the investigation in 2015. Narottam Yadav, a resident of Jauri village in Bhind district, had been selected and posted as a constable in Morena district. Investigation proved that Rishabh Agrawal, a resident of Allahabad, had impersonated for him at the examination centre in Rewa, and documents were tampered with to ensure selection and posting for Narottam. The impersonator had been arranged by middleman Prabhat Mehta. The Special Task Force (STF) of Madhya Pradesh had investigated the matter but it had named only candidate Narottam in the chargesheet and his father Bhagwan Singh Yadav and a relative Avinash Singh in the supplementary chargesheet as accused. After the case was transferred to the CBI on orders from the Supreme Court, the central agency probed the matter further to nab the impersonator and the middleman. The five were booked under Sections 467, 419, 420, 465, 468 and 471 of IPC read with Section 120 (b) of IPC as also under the Madhya Pradesh Recognized Examination Act, 1937. Special Judge S C Upadhyay convicted all five accused under Section 467 for seven years and for lesser terms under the other sections. The accused were fined Rs 6,500. The defence advocates sought leniency under the Probation of Offenders Act on the ground that it was the first offence but the court rejected the argument. The judge said he was sentencing the accused to seven years to create an impact. “The accused did not want to get jobs for themselves but also wanted to provide jobs to other candidates. Had this (scam) continued for some more time, the social fabric of the country would have been destroyed. The students would have stopped studying and use their mental faculties to illegally grab the posts they wanted. In such a situation even if they (accused) they did not have any criminal background they don’t deserve sympathy. If leniency is show it will have disastrous impact on the society and people would stop fearing the power of the law,’’ the judge observed while refusing to show leniency towards the accused. Rishab, 26, a BTech from Motilal Nehru National Institute of Technology, attached certificates from National Talent Search exam and Indian Institute of Information Technology, Allahabad, to shore up his credentials. Prabhat Kumar, 25, is also a BTech and was employed with Tata Motors. Narottam, 24, completed his BSc (first year) while Avinash, 26, did not complete MBBS. The defence counsels argued that the accused were left with no choice to pursue illegal means because everybody from top officials in Vyapam to racketeers to candidates were active and illegal appointments were being made.